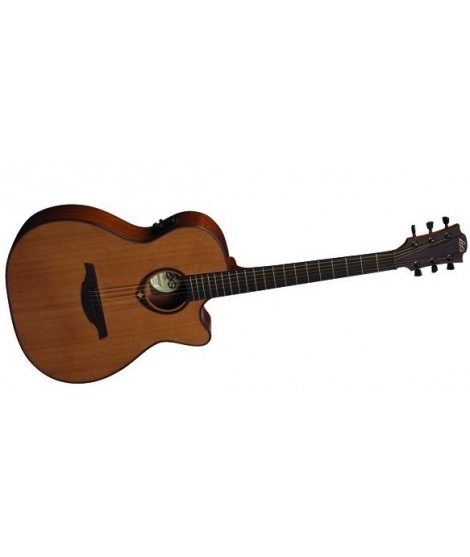 The Lag T200ACE Auditorium Cutaway Acoustic-Electric Guitar has an oil-finished solid Indonesian rosewood headstock, decorated with a maple LAG logo inlay, which complements the refined French satin finish. 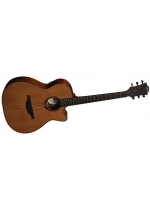 A distinctive guitar with a solid red cedar, mahogany back & sides and expanded electronics. 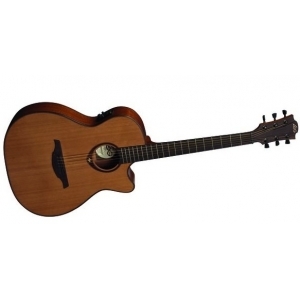 The Lag T200ACE Auditorium Cutaway Acoustic-Electric Guitar has an oil-finished solid Indonesian rosewood headstock, decorated with a maple LAG logo inlay, which complements the refined French satin finish. Satin black tuners are matched to satin black tulip buttons; black graphite is used to create the compensated saddle and nut. Fine Indonesian rosewood provides an easily-played fingerboard and a solid bridge. The body features a solid Red Cedar top and mahogany back and sides. StudioLâg Plus electronics with 5 expertly voiced EQ settings and Volume control offers quick and precise adjustment in any venue.